Hydration force. Fluid light moisturizer. Moisturizer. Soothing. Normal to combination sensitive skin. 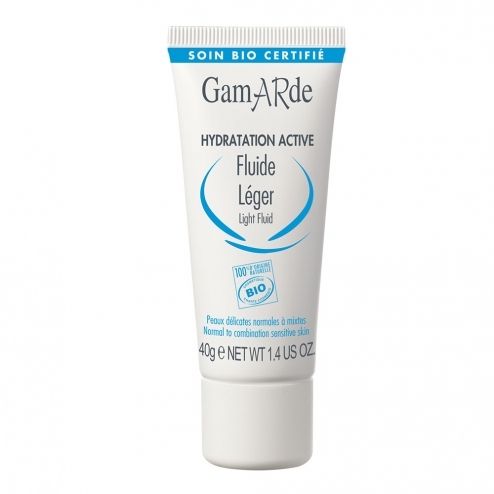 Fluid and non-greasy LIGHT HYDRATING FLUID moisturizes and soothes sensitive skin permanently mixed with normal water Gamarde les-Bains anti-irritant with the naturally occurring hyaluronic acid hydro-fixer and oil Argan BIO regenerating. Intensely replenished, the skin regains suppleness and radiance. Directions: Clean your skin using the GENTLE CLEANSING MILK and GENTLE SOOTHING LOTION. FLUID LIGHT MOISTURIZER Apply on the face, neck and chest. Composition: INCI formula: Water Guamarda (guamarda water), Sesamum indicum (sesame seed oil), sucrose distearate, glycerin (vegetable), glycerin (vegetable), cera alba (beeswax), cetearyl alcohol,, argania spinosa (argan kernel oil), sucrose stearate, isostearyl avocadate, glyceryl caprylate, Silica, Lavandula hybrida (lavender) oil, Cymbopogon martini (palmarosa) oil, Aniba rosaedora (wood rosewood) oil, Lavandula angustifolia (Lavender) oil, sodium hyaluronate, parfum (natural fragrance), xanthan gum , citric acid.